Nance Place, on Rolling Mill Hill overlooking the Cumberland and Downtown, is the first multi-family development in Tennessee to achieve Platinum LEED certification. It was developed by MDHA. When it comes to new houses, green is the new granite. A decade or more ago, luxury amenities such as granite countertops in kitchens and baths became “must-have” necessities. Now green building practices that once seemed exotic are becoming standard in homes at every price. Habitat for Humanity of Greater Nashville, for example, will build at least 40 houses this year. All of them will be LEED certified, meaning they meet the highest standards for sustainability and energy efficiency. So are the new, affordably priced apartments built by the Metropolitan Development and Housing Agency (MDHA) in downtown’s newest neighborhood, Rolling Mill Hill. Meanwhile, every one of the $500,000 to $2 million custom homes built by Castle Homes is green, too. The reasons are simple. Green construction practices reduce energy consumption and help save the planet. They also increase the value of a home and slash monthly utility bills. “As gas prices approach $4 or even $5 a gallon, people say (homes) need to be more efficient,” says Alan Looney, Castle’s president. Castle builds all of its homes to specificationss set by the U.S. Dept. of Energy’s Energy Star program, the National Association of Home Builders or the U.S. Green Building Council’s LEED (Leadership in Energy and Environmental Design) standards. Middle Tennessee has embraced green building practices, and Nashville is home to the South’s first LEED-certified neighborhood, the Gulch, where luxury condominiums in the Terrazzo building are LEED certified and Pine Street Flats, the luxury apartment building under construction nearby, is also being built to LEED standards. The city will soon have its first Energy Star certified-neighborhood, says Village Real Estate Realtor Mark Deutschmann. Planned for East Nashville’s Rosebank neighborhood, the Nouvell development will feature 15 LEED-certified single-family homes with soaring ceilings, low-e windows and radiant roofs. It also will include a community green space and a system to capture rainwater. Homes will be built by Woodland Street Partners and have prices ranging from $224,900 to $269,900. “We’ve seen one-offs” of individual LEED houses being built, “but not a whole subdivision,” Deutschmann says. So, how green is Middle Tennessee’s home building industry? Mark West is a principal with Exoterra Architecture + Sustainability Consulting and a committee member of the Middle Tennessee Chapter of the U.S. Green Building Council (USGBC). He estimates that one-third of the residences being built here are certified by the USGBC or another organization. Going green can add several thousand dollars to the price of a home, he says, but many home owners are convinced it’s worth the price. A green house is not only more energy efficient and healthier to live in, it’s built better than an ordinary house. What does it take for a home to be green, whether it’s certified or not? Gale Park, a Village Real Estate development in the 12South-Melrose district, has green features that include cellulose insulation, radiant-barrier roofs to keep interiors cool, double-glazed low-e windows, compact fluorescent lights and Energy Star Appliances. Earlier developments marketed by Village, Germantown Station and West End Station, have similar green elements, as do many homes throughout Middle Tennessee that haven’t necessarily gone through the process of becoming certified. There are a number of certification programs to choose from, including the Department of Energy’s Energy Star, the U.S. Green Building Council’s LEED program, EarthCraft, which certifies homes in the Southeastern United States, and the National Association of Home Builders’ (NAHB) program. All of them take time and money that some home buyers would rather not spend just for the satisfaction of being certified. It’s enough for them to know that their home meets the standard, even if they don’t have documentation. “They just want to know they’re getting a good home,” says Castle’s Looney. Castle’s green elements include “dual fuel” gas and electric heating. The system uses the most efficient fuel for the current temperature. Castle’s homes also have tankless water heaters, foam and cellulose insulation, low-e windows and other energy efficient features. The majority the homes built by Castle are certified by the NAHB or Energy Star. Danny Herron, CEO of Habitat for Humanity of Greater Nashville, says building to LEED standards adds $2,000 to $3,000 to the cost of building each of the organization’s 1,200-square-foot houses. That cost is covered by grants and does not add to the buyer’s cost. Despite the cost, green construction is a good investment, he says. The houses are more structurally sound than ordinary houses and have higher quality roofs and heating and air-conditioning systems. And the houses pay a dividend each month with lower electricity bills. Habitat house owners pay an average of just $80. “An extra $50 off the power bill can really help,” says Herron. The savings add up. Over the 30-year period of their mortgage, each Habitat home owner will save more than $25,000 in utility costs, says Ralph Knauss, the organization’s chief operating officer. For the past 20 years, American businesses and families have saved nearly $230 billion on utility bills and prevented greenhouse gas emissions equal to more than 350 million vehicles with the assistance of the Energy Star program, U.S. Environmental Protection Agency figures show. The EPA recently gave Nashville’s Habitat program its Energy Star Sustained Excellence Award for the third year in a row in recognition of the chapter’s continued leadership in protecting the environment through energy efficiency. Habitat has built 86 Energy Star homes in the past two years. 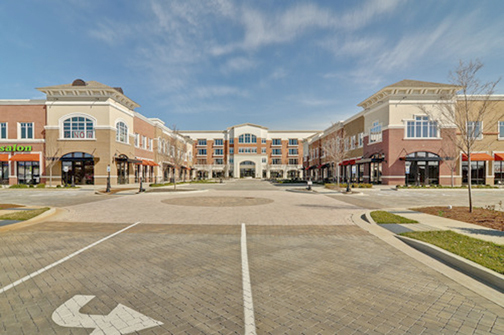 Gateway Village in Murfreesboro contains 62 condominiums with office and retail space on the ground floor. The development is on track to become Rutherford County’s first LEED-certified mixed use project. Don’t let the blue water in the tiolets there startle you. Most recipients of the award are large businesses, including Fortune 500 companies, not nonprofits, Herron says. 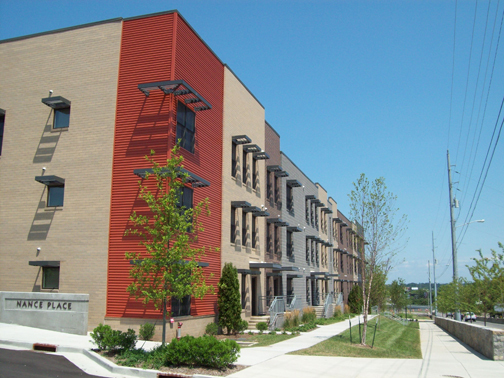 Residents of Nance Place, the LEED-certified affordable apartments developed in Rolling Mill Hills by the Metropolitan Development and Housing Agency, also benefit from better construction and lower bills for electricity and water. “It’s good for them and, we think, good for us,” says Phil Ryan, MDHA’s executive director. Nance Place is the first multi-family development in Tennessee to achieve Platinum LEED designation, the highest level of certification. Nance Place features 109 one- to three-bedroom apartments, as well as studios, for renters earning 60 percent or less of the local median income. They feature environmentally friendly carpet, flooring, tile and wood, cabinets made with recycled content, Energy Star appliances and efficient lighting. The building also features a white “cool roof” to reflect summer heat and a courtyard with a rainwater collection and treatment for its drought-resistant plants. A casual observer might not see the featurtes that make a residence green. At Gateway Village in Murfreesboro, at least one feature is impossible to miss: blue water in the toilets. The development of 62 condominiums with office and retail space on the ground floor is on track to become Rutherford County’s first LEED-certified mixed use project, says developer Joe Swanson Jr., chief manager of the Swanson Cos.
What does blue water have to do with green construction? Murfreesboro requires developers to use reclaimed waste water for irrigation. Gateway took that a step further and uses reclaimed water for toilet flushing. The water is dyed blue. Like Nance Place, Gateway has a white roof that reflects the sun’s heat and reduces energy consumption. “It reduces the ‘heat island’ effect that increases air-conditioning use and smog production,” says the Green Building Council’s West. Recharging stations for electric vehicles. Motorists can swipe their credit card, just like in a store, to pay for a charge. Reserved parking spaces for vehicles that get 38 mpg or more. Permeable parking lot pavers that let water soak through them. There is no runoff into storm drains. The pavers are colored a light shade to reflect the sun’s heat. Recycling stations are placed throughout the development. There are carbon monoxide detectors in each condo. If there is a crowd in a condo – during a party, for example – an air circulator automatically brings in fresh air. Almost all construction materials have recycled content. The concrete, for example, contains fly ash from coal-fired power plants. To encourage commercial tenants to commute by bicycle or exercise during their lunch hour, Gateway has shower facilities available. Like granite countertops, green features can be expensive, says Swanson. The permeable pavers cost more than $120,000, for example. But the result is lower day-to-day operating costs and less impact on the environment. Swanson believes everyone will soon be building and buying green houses, even if they don’t realize it.